Investors need to follow economic trends because the stock market tends to move in the same direction in the long run. Economic booms tend to be good for stocks while `economic busts often lead to significant declines in stock prices. In the case of China, it is possible the long economic boom is ending. This can be seen in the chart below. “Persistent weaknesses in productivity growth and a looming demographic catastrophe will hobble the country for decades to come. The Chinese economy has done an exemplary job of boosting its labor and capital inputs since Deng Xiaoping began the process of “reform and opening up” in 1978. It has done far less well at improving its use of those inputs. According to an estimate from Harry Xiaoying Wu of Japan’s Hitotsubashi University, China’s underlying efficiency has not improved at allsince the mid-1980s. In fact, he estimates Chinese businesses are now 15% less productive than they were in 2007. The problem is the government’s widespread and persistent interference in investment decisions—a problem that has been getting worse. Since the end of 2012, the share of new credit extended to China’s state-owned enterprises has soared from about 50% to more than 80%. China’s vibrant pockets of private innovation have been squeezed for political reasons. 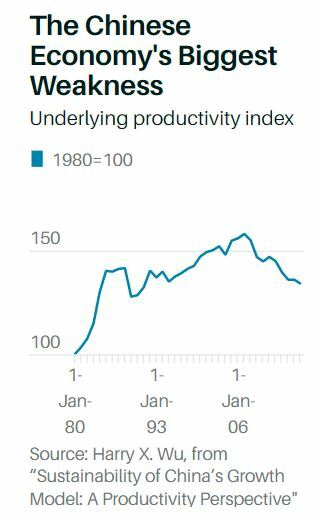 While it is possible the political situation could change, and therefore lead to a renewed burst of productivity growth, as in 1978, that is not the likeliest outcome. Zero productivity growth, or even continued declines, are far more likely. Reforms to the Chinese political system are at least theoretically possible. A radical improvement in China’s demographic outlook, however, is not. Until recently, China’s demographics provided a significant growth impulse to the Chinese economy. The number of Chinese aged 20-59 nearly doubled between 1978 and the peak in 2013, from 434 million to 855 million. 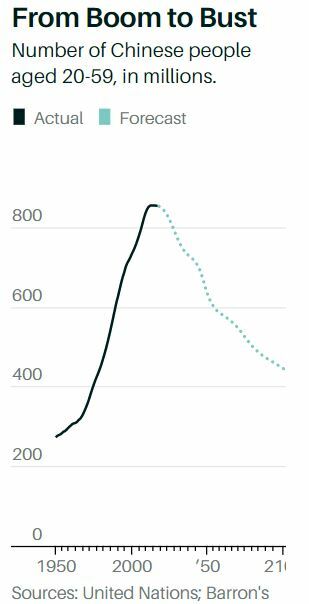 Essentially all of the growth in the total number of Chinese during this period was caused by the booming number of people of prime working age. Simply adding people to a society doesn’t make that society richer, although it can lead to higher production of goods and services to satisfy the needs of additional consumers. Adding workers, however, does lead to greater productive capacity. It is easier to raise material living standards for everyone when there are relatively fewer children and older people to support. Even more important is adding workers in the right age range. Young people are inexperienced, while the elderly are less likely to generate new ideas or adapt to new technologies. Economists have repeatedly found that changes in the share of people in their 40s can meaningfully affect productivity growth. Patents, for example, are overwhelmingly filed by people in their 40s, while the best managers tend to be neither too young nor too old. Economists have also found the general relationship between a society’s age structure and productivity holds elsewhere, including Europe and Japan. China’s population structure was a tailwind for growth. The proportion of Chinese aged 40-49 doubled between 1978 and its peak in 2013. More than a third of the total growth in China’s population during its boom years came from the massive growth in the number of Chinese in their most-productive decade. But, now, that positive growth impulse from demography has started to reverse. The number of Chinese aged 20-59 has already shrunk by about 0.5% since the peak in 2013, while the number of Chinese in their 40s has plunged by 10%. “China’s total population, however, is expected to remain relatively stable over this period. The rapid shrinkage of the working-age population is projected to be offset by the booming population of elderly Chinese as today’s workers age. The share of Chinese aged 70 and older is projected to rise from less than 7% today to 20% by 2049. That will place severe burdens on working-age Chinese, who will need to sacrifice their own consumption to support their elders. The outlook for the second half of the century looks even grimmer. While population projections that far in advance can be prone to substantial errors, the baseline forecast is for the number of working-age Chinese to collapse by half over the next 80 years, even as the number of Chinese aged 70 or older nearly triples. No society has any experience with this kind of demographic transition, especially when starting from China’s low level of development. For investors in the United States, the iShares FTSE China Index Fund (NYSE: FXI) could offer a trade on this long term trend. FXI has pulled back but may not fully reflect the danger that population shifts present to the Chinese economy. These are long term dangers and a long term strategy could be to use put options. While it may be possible to short the ETF, shorting presents risks, especially in the long run. While a short position benefits from a price decline, the trader, the trader must pay interest to their broker for the short trade. This interest rate can vary and can be quite high at times. There is also the risk that a short position could be called by a broker which forces the trader to close the trade. That is not a risk with a put option. Put options also benefit from price declines. Long term options in FXI could deliver gains as the demographic trends unfold. This could require opening new positions as existing positions expire. Overall, this a strategy that could be the one with the least risk for the long run. But, put options also carry risks. The risk is that the option could expire worthless. This risk factor must be considered by traders before they open any position in options.